Time: Friday 4:30 to 8:30 p.m. If you’ve thought about making your own rugs or table coverings but just never had the space to house a loom, here’s an opportunity to get inspired, learn how to start your project and get assistance when you need it most. Diana will help students set up to use the looms in the Loom Room. Students will learn the basics of preparing fabrics, choosing a design, warping and beginning to weave. Those who would like to continue their projects can schedule time with Diana on Saturday and Sunday to work on their projects from beginning to end. Supplies: $10 or more based on supplies used. The supply fee is paid to the instructor at the conclusion of class. Students should provide their own material. 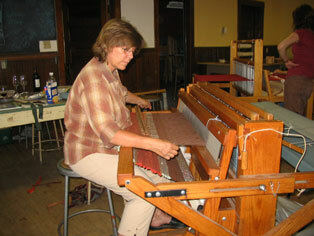 Members who have taken this workshop have access to the Loom Room to work on their own projects. 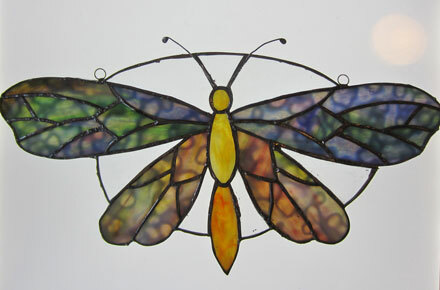 This class will give students the opportunity to learn and practice the copper-foil stained glass technique. It is a great class for beginner to start this art form. For those experienced with this technique, try a complicated design. On day one, students will decide on the pattern of their piece. Pattern sheets are available for use, or students can design their own pattern. There will be a discussion of glass safety and demonstration on how to use the equipment. Glass is chosen and pieces are cut using glass cutters, grinders, and saws. Then on day two, students will solder their pieces together and attach a copper wire for hanging. A patina may be applied to the solder if desired. No previous glass cutting experience is required. Supplies: $30. The supply fee is paid to the instructor at the conclusion of class. Additional material can be purchased in the class. The ancient art form of Pisanki – writing symbols, designs on an egg, transforming the elements of the earth – water, air and fire into something precious and wondrous. Pisanki are inspired by nature and steeped in tradition. You will learn the old world method: taking a wooden handled metal funnel filled with beeswax that is melted by the flame of a candle. The melted beeswax is your pencil and the egg is the canvas. 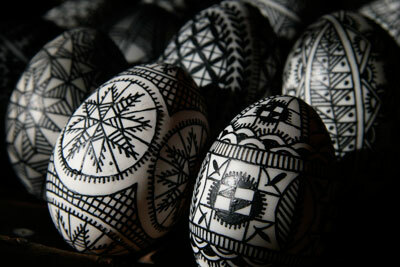 The instructor will talk about the traditions and customs around the egg, as well as Easter in Poland. The instructor will provide designs, instructions, writing tool, organic eggs, beeswax,candles and dyes. You will leave with a knowledge, understanding and technical skills of the amazing folk art of Polish Pisanki. Supplies: A supply fee of $20 is paid to the instructor at the conclusion of the class. Everything supplied by the instructor. Level: All levels welcome, beginners and experienced. 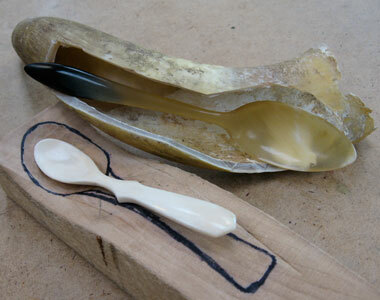 Scandinavian-style spoon carvers or figure carvers know that Harley Refsal usually works in wood. But in recent years he has also begun to work in horn, bone and antler…“the plastic of the pre-industrial era” …making everything from shoe horns to spoons to jewelry. These materials were commonly used throughout history, especially in areas where there were few trees, and the tradition of using these materials continued right up into the 20th century. Class participants will make a horn (cow, bison, or goat horn) spoon, as well as two or more items from bone or antler, such as a Stone Age inspired fish hook pendant. We will work outdoors as much as possible, as these materials can tend to be a bit odoriferous. Feel free to bring along any Dremel-type tool you may have, but the instructor will bring along a supply of hand tools and a couple of Dremel-type tools for class use. (People who have taken knifemaking courses will find that rasps, files, etc. used in knifemaking lend themselves well to working in these materials as well.) Please bring a quality compass and mechanical pencil. The Milan Village Arts School recognizes art is a lifelong journey. Our Studio Program strives to furnish students with the tools and means to achieve their artistic goals. One of our Studios, the Weaving Studio, gives students the opportunity to create beautiful rugs from old jeans, blankets, and other articles of clothing. 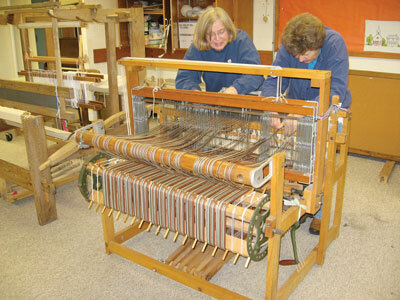 Outfitted with six large floor looms and several smaller table looms, the studio is well equipped to meet all our students weaving needs.